Here are the details. 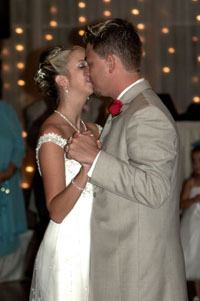 We got married on 7/12/09, exactly one year to the day from when Kevin first said he loved me. We wanted our wedding to feel very “us”, so we decided to take advantage of our surroundings and have a summer beach wedding! I am so happy with our choice! Kevin and I planned our entire wedding and made every decision. 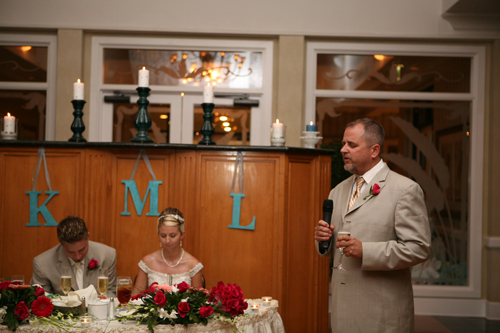 Kevin was the financial guy equipped with a detailed spreadsheet and all; I (and my Mom) were the decor planners! From the invitations and decor to the food and entertainment, we pulled out all the stops (without breaking the bank) by doing extra research and taking on DIY Projects! So let’s take a journey back to our special day! 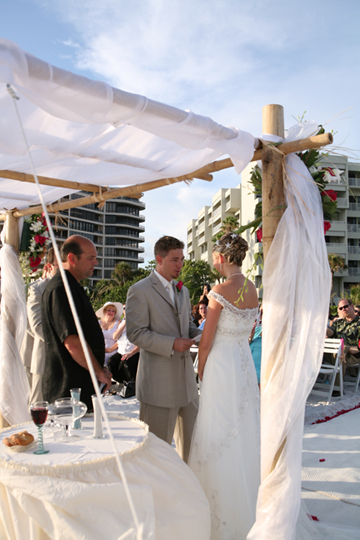 Our wedding ceremony was on the beach, the cocktail hour on the lawn at the bayside (harbor side) and the reception in the beautiful ballroom all at the Longboat Key Club & Resort. 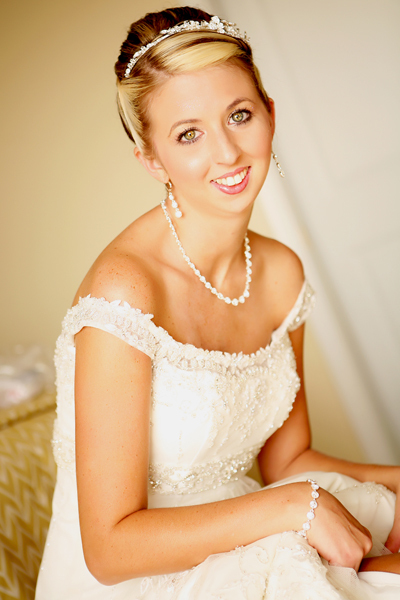 We were assigned an event planner from their staff (Bonnie) and she was absolutely a treat to work with! She kept the ball rolling and had everything organized and documented. Want to learn more about the resort, juct click here. Here’s a look back at all the paper goods for our event… we designed everything from our beachy invitation all the way to the custom fans! 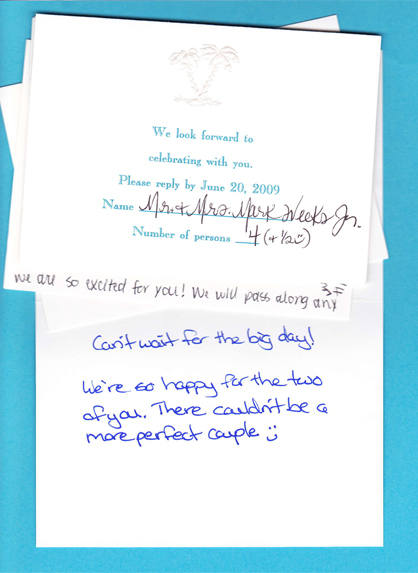 We got engaged March 29, 2009, so there wasn’t much time for a Save-the-Date, so we took the money we save there and invested it in our invitations. 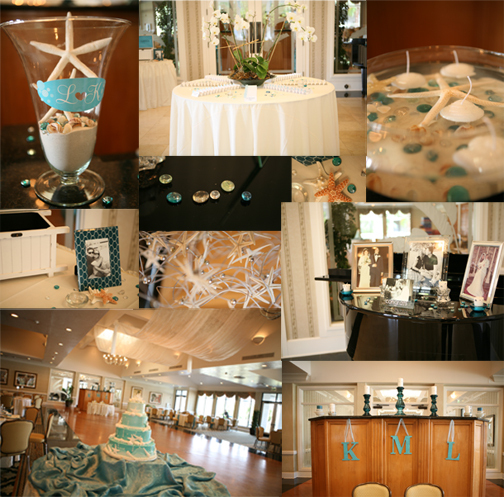 We wanted something elegant that set the tone for the “look” and still said “beach wedding”! We received a major discount at printing them through our local Tux Store, so I designed them, and then had them printed. We did, however, package them (complete with our RSVP card, hotel info and directions) in beautiful envelopes which Mom and I had the pleasure of hand addressing with calligraphy pens! I am big on handwritten addressing… it gives a personal touch! One of my favorite parts about the wedding planning experience, was running to the mailbox everyday to see the response cards flying in with all kinds of fun notes! We love them so much, we kept each one and stored them in a decorative box (along with every wedding card we received). 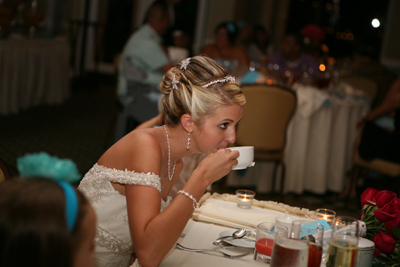 It is always fun to reminisce about our wedding, family and friends! There’s nothing better than keepsakes that go beyond the traditional (click here for a post on creative ways to tie in your wedding in your home). 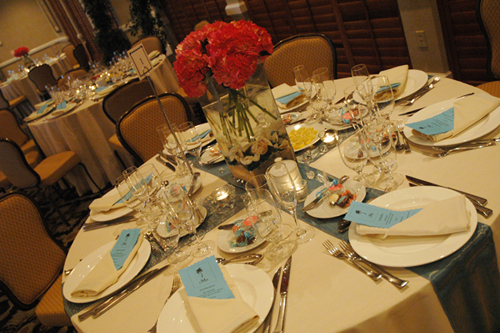 Last on the paper trail were the place cards, the menu’s and the programs. 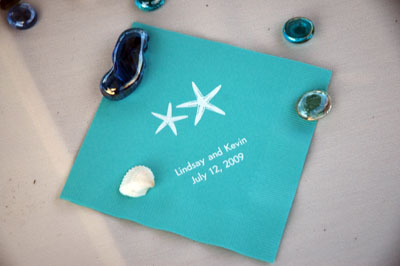 To add a sweet touch to the cheap nice inexpensive cards we had chosen, we printed each guests name out and glued an aqua paper flower to each one. They were adorable! 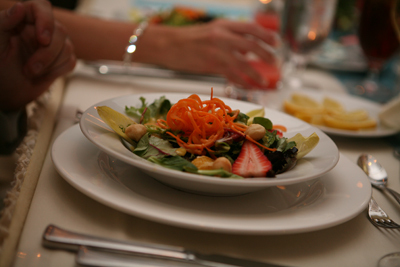 We also created our own Menu for each Napkin which kept with the design of our hotel directions etc. Since it our wedding was in the summer and on the beach, we though what better way to cool of our guests and have them enjoy our ceremony agenda than a fan program! I absolutely adore them! We purchased them from a party store and then just tied ribbon around them for an extra bit of color! 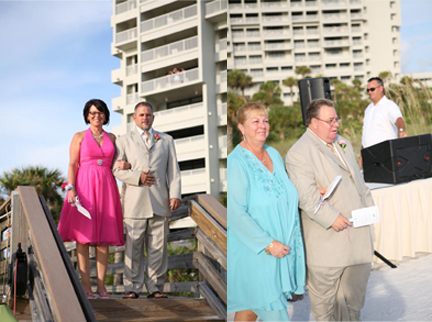 In a flash, our response cards turned into our family and friends all seated on Longboat Key Beach all awaiting the glorious moment when we said I DO. We carried the personality of our relationship into every word we said during our ceremony. My Uncle Randy (pastors in Charlotte… click here for his site) married us, which was very special to me! We were encouraged to call our ceremony a covenant and write our own vows. 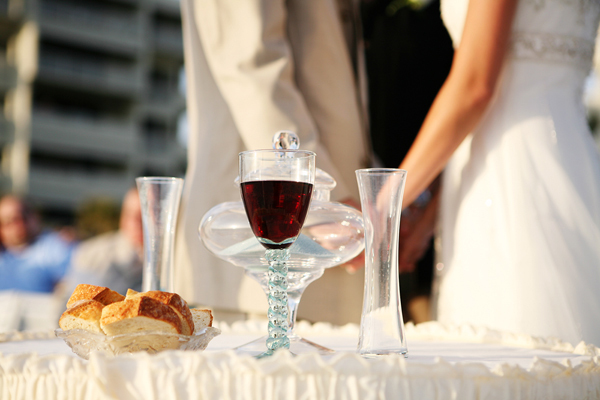 We took his advice and it made for an incredible romantic and sweet ceremony covenant. (I will show you a fun DIY Project I later did with our vows). We had my friend Brooke sing a beautiful song (How Could I Ask for More by Cindy Morgan… click here to hear). All in all, the ceremony ended up being our favorite part of our wedding… I truly felt so much love, peace and joy! And now for the thirst quenching wedding DIY decor that you’ve all been waiting for. 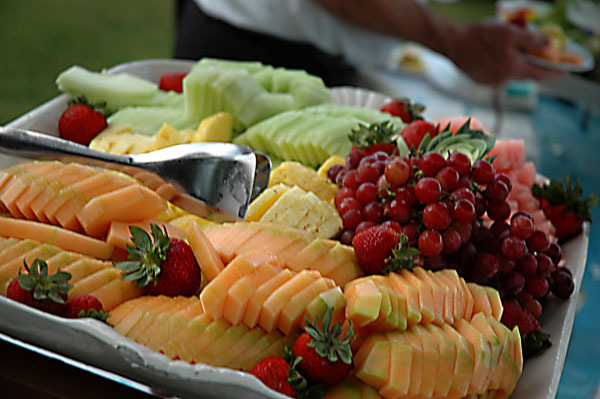 From the moment people arrived, we wanted to make sure they felt like they were on vacation! 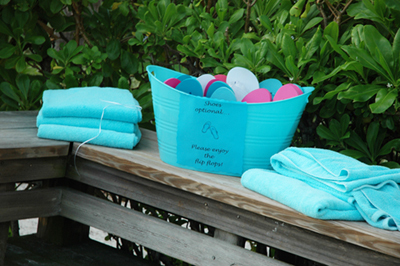 So we created an area on the boardwalk to offer complimentary flip-flops for the guests whose shoes were a bit too exciting for the sandy beach wedding and a towel to sit down on the way back in to brush the sand off their toes! (Each pair of flip flops… only $1 from Michael’s Craft Store). 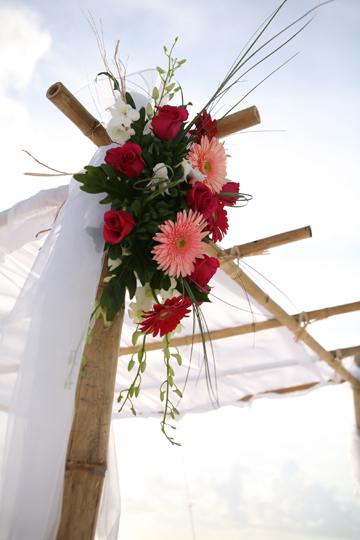 * Arch Decoration Full Bamboo Canopy with fabric draped sheer panels and two floral clusters of gerbera daisies, hot pink roses, white dendrobium orchids and tropical foliage accents for an “airy tropical look”. 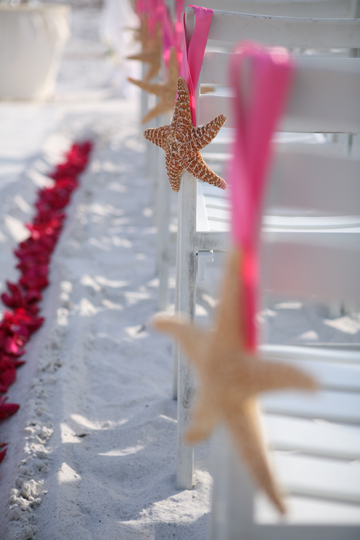 * Chair Decorations Large starfish with hot pink ribbon hanging from chairs. Bride’s Bouquet: Hand tied bouquet of 24 hot pink roses. Stem treatment with white satin ribbon. 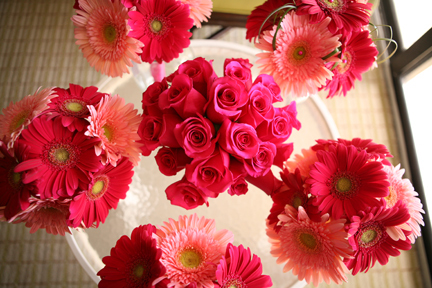 Matron of Honor’s Bouquet: Hand tied bouquet of 7 gerbera daisies in hot pink and medium pink. Stem treatment with matching ribbon. Adding hot pink pearl pins in to the center of the gerbera daisies and bear grass loops. Bridesmaid’s Bouquet (4): Hand tied bouquet of 7 gerbera daisies in hot pink and medium pink. Stem treatment with matching ribbon. Flower Girl’s Bouquet (1): Hot pink rose petals. (I provided the basket). 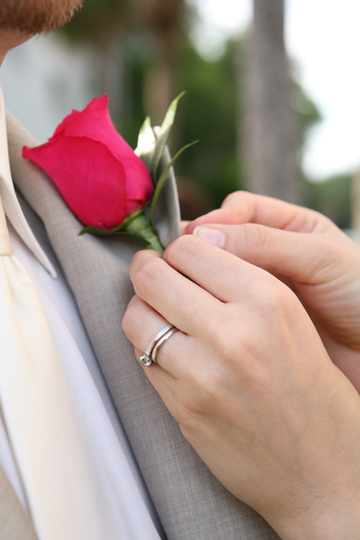 Groom: Hot pink rose with a touch of greenery. Groomsmen (4): Medium pink rose with a touch of greenery. 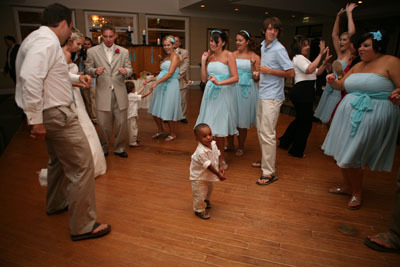 Ring bearer (2): Hot pink spray rose and touch of greenery. 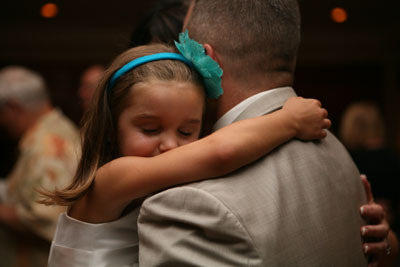 Groom’s Father: Pink miniature carnations and touch of greenery. Bride’s Mother: (Wristlet) Hot pink spray roses with a touch of greenery and a small ribbon bow. Groom’s Mother: (Wristlet) Pink miniature carnations and a couple white dendro blooms with a touch of greenery and a small ribbon bow. Grandmother (1): (Pin On) Single cream rose with a touch of greenery and a small ribbon bow. Grandmother (2): (Wristlet) Cream roses with hot pink spray rose blooms and a small ribbon bow. Singer: (Pin On): Single cream rose with a touch of greenery and a small ribbon bow. 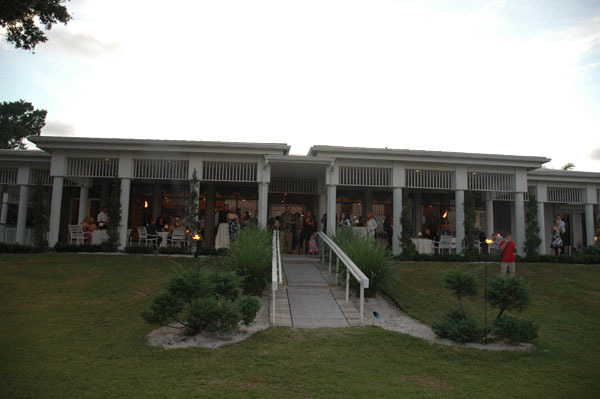 When all the “I Do’s were said and done and our covenant was made, all of our guests went straight from the beach over the harbor side to a fun cocktail hour on the lawn (complete with tiki torch lighting). We wanted a celebration that felt festive and fun without sacrificing an ounce of style, so we came up with fabulous reception décor! 1. Lobby Décor: All DIY! 2. Ballroom Entrance: All DIY. 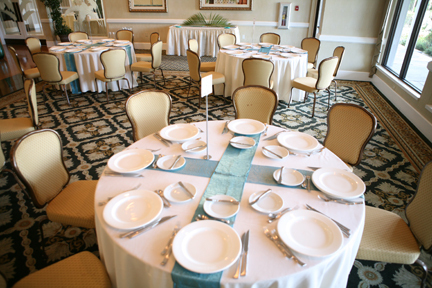 1st Guest Table Centerpieces: Tall Square Vase (Rental) layered with sand, aqua gemstones and a few seashells. A hand tied bouquet of large cream hydrangea (sprayed hot pink – raspberry pink paint) to be placed in vase. 2nd Guest Table Centerpieces: “6”cube vase (Rental) with a layer of sand, aqua gemstones and a few seashells with a single raspberry pink gerbera daisy floating on top. 5. Sheers with lights were billowing from the ceiling (we totally scored a deal since the wedding the night before used them too). 6. 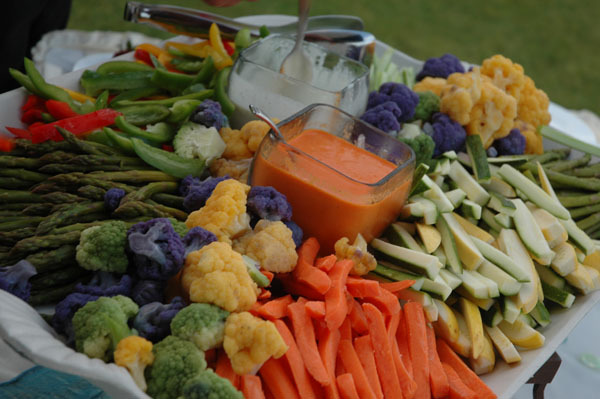 Favors: DIY. Mom, Kevin and I sat up until the wee hours of the night morning and made chocolates from several nautical molds we ordered online. We mixed/swirled milk chocolate, white chocolate and pink and aqua colored chocolate into the molds (from here) and created such cute little candies! We packed 5 up in each plastic bag and tied them with ribbon and a fun tag (from here). So fun! 8. Personalized napkins (from here). You may also be wondering about our get ups attire. We went as beachy as possible since we were on the beach, in Florida, in July. 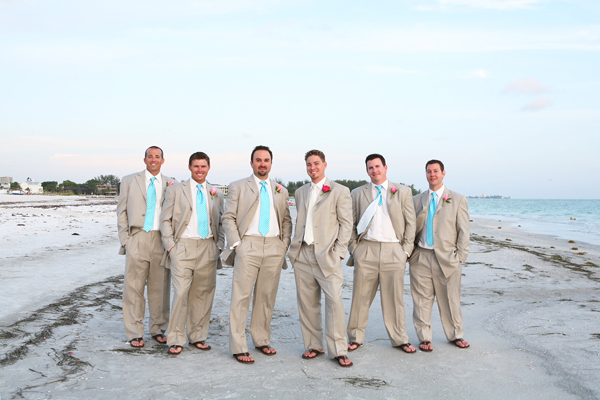 Kevin chose a fantastic light khaki suit, an ivory button down shirt and an ivory/golden striped tie and flip flops for the ceremony and shoes for the reception (since it’s a little hard to get your groove on in flip flops). 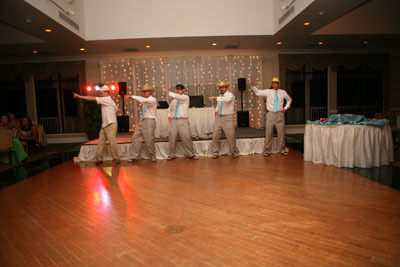 The groomsmen all wore the same suit and shirt, except with an aqua striped tie. 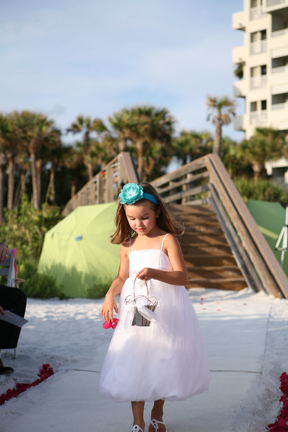 Their flip flops were gifts from Kevin and were also worn during the ceremony and changed for the reception! But you’re probably wondering about my outfit too. The story here is I actually bought my dress before we got engaged. Yes, I was keeping my fingers crossed and hoping for the question and the girls (my mom, sister, Kevin’s mom and my friend Melissa) all drove up to Tampa and went “browsing” for a day. The first place we stopped, I tried on like 15 dresses and was miserable in all 15. So we stopped for lunch at the Cheesecake Factory and stopped in a place we stumbled upon on the way back to the interstate. Brides by Demetrio’s were just about to close but they said I could pick 4 dresses and then come back if I needed more time! Well, we rushed through their like mad women and grabbed 4 dresses. My sister picked the first one, and as soon as I had it on I walked out to show the girls sobbing. I knew that dress was it. I felt so in love and so beautiful, just like Cinderella! So, my mom did the work for me and called my dad!! The next day we were back and placed the order! Love my parents! 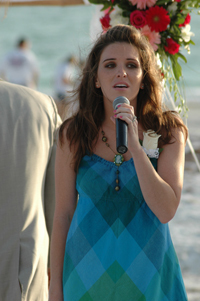 (One fun fact: The dress was brand new in the collection and I was the first EVER to buy it!) Here’s the dress as I was trying it on! 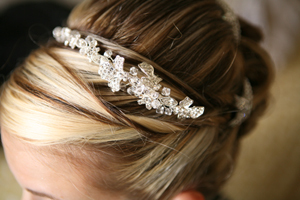 My sister (a hair dresser) did all of the girls hair… including mine… I purchased a beautiful headband/tiara from Tiffany’s on a trip to Richmond for my bridal shower. 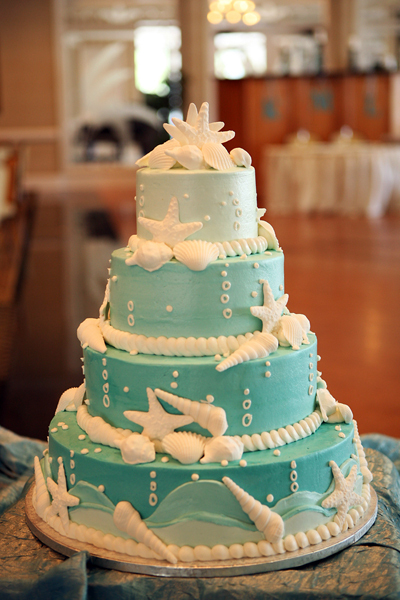 Then, I knew I had to go beachy since everyhing in our wedding included starfish etc. 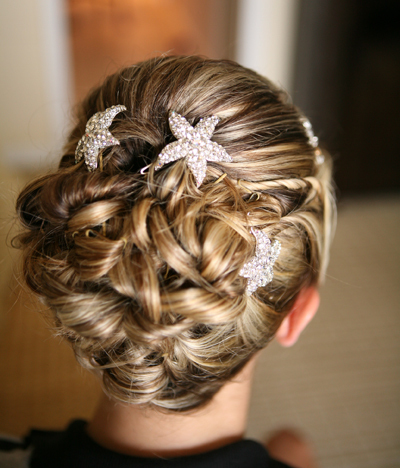 So I went on a major search for diamond/ silver starfish hair barettes… well I scored some from here. 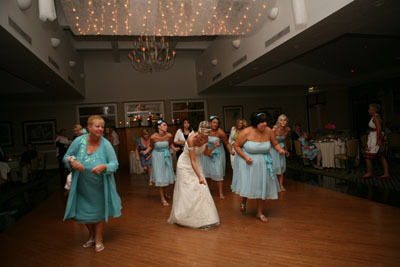 My bridesmaids all wore aqua dresses came from Alfred Angelo (click here for info… we chose knee length though). 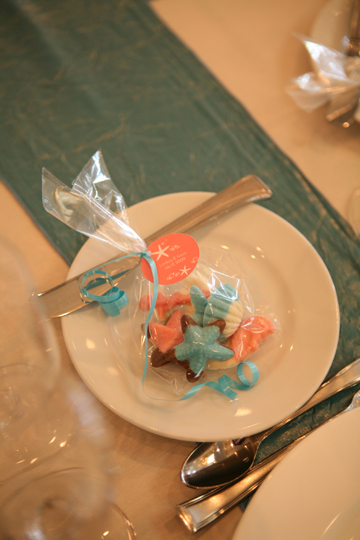 Their gift from me was their fun, glizy starfish shoes, the silver starfish necklace and earrings, and their aqua headbands…. So pretty! The Flower Girl used a dress she already had, we just cut the bow off and sewed a starfish on the front and the Ring bearer’s outfits were purchased from the Children’s Place on sale! Gotta love these kids… my sweet niece and nephews (not all were in the wedding, two weren’t here yet, you can see one by looking at my sister-in-law’s belly… the blonde to my left)! Then Dance the night away…. Now that you have virtually crashed our wedding, we appreciate your attendance! And speaking of attendance, we owe a HUGE thanks to our photographer Jennifer Soos who is responsible for all of our 1500 or so wedding photos, you can find out more information right here. My brother does all things video, so he was the videographer for our wedding, maybe we will share some snip-it’s with you on next year’s wedding week! Oh, we have a Wedding Week every year to celebrate our Anniversary… so, do come back for more fun posts on DIY Wedding Décor, Traditions, Design and more on Our Wedding!! 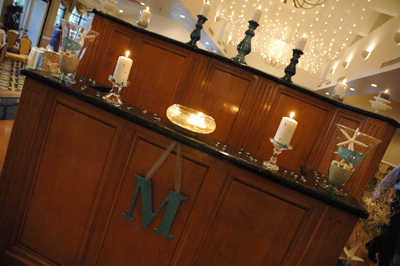 Want to learn how we brought bits and pieces for our wedding right into our home’s decor? Well, click here! 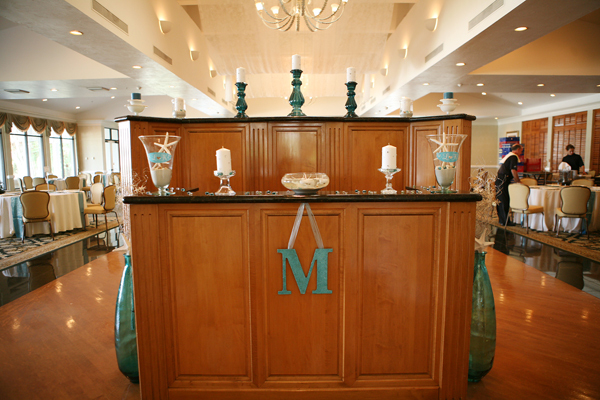 Images courtesy of A Design Story, LLC & Jennifer Soos Photography. P.S. 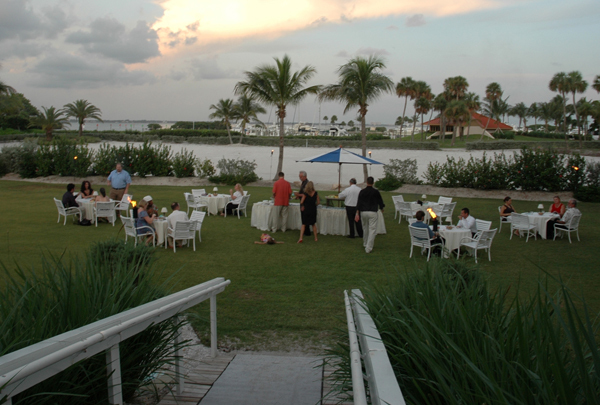 Are you local to Sarasota, Florida or the bay area and need a wedding planner? We do that too! Email us @ lindsay@adesignstory.com for more information!